We’ve had a great response so far when we asked you to share your feedback on our recent parks improvements. 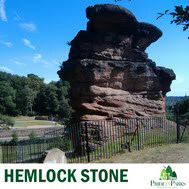 We’ve extended it because we want more feedback on particular sites including the Hemlock Stone Open Space, Long Lane Recreation Ground, Hetley Pearson Recreation Ground, Weirfields Recreation Ground, Jubilee Park, Mansfield Road Recreation Ground, and Knowle Park. Help us make sure our parks meet the Broxtowe Standard and allow us all to have Pride in Parks.